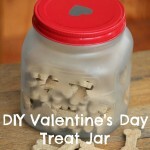 How to Spice Up Store Bought Dog Treats for Football Season Happy Valentine’s Day! I’ve always been fascinated with buttons. They have their practical uses on clothing of course, but when you put a whole bunch of them together they can turn into a piece of beautiful artwork. Plus, when you aren’t too concerned if they match, they typically aren’t too pricey. You can pick up a variety pack at most craft stores for only a few bucks and you may even have some laying around your house. A button art craft project has been on my to do list for a few months now and I thought with Valentine’s Day nearly here there couldn’t be a better time to finally do it! 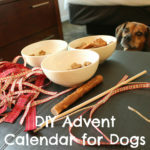 This DIY project is an excellent last minute gift idea for a dog mom or pet lover. It’s also a great bonding activity for you and your kids or loved one. 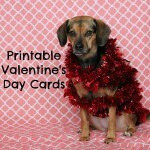 If you have a crafty Valentine, this project is definitely a fun way to spend a few hours with them! But it’s definitely not limited to Valentine’s Day. This would make a wonderful gift any time of the year for anyone who loves their pets. I’m planning to keep my finished button art up all year round! 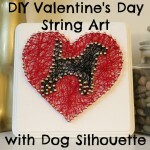 Dog Silhouette or LOVE Pattern – Download LOVE Printable here. I picked up a pack of three 8×10 Canvas Panels and a Jar O Buttons in both pink and red from my local Jo-Ann Fabric and Craft store and was able to utilize a few different coupons. You should also be able to find the supplies at Michaels or AC Moore. No matter which craft store you have near you, make sure to check their website or mobile app for coupons to save, save, save! Variations: Instead of a canvas panel, you can use a piece of wood or regular canvas for the background. I selected a canvas panel because I wanted to be able to frame the finished art and the panels are thinner than both of the other options. You can also use regular tacky glue or even hot glue to attach the buttons. I went with the Quick Dry Tacky Glue because it gave me enough time to re-position buttons if needed while drying fast enough, so they weren’t constantly moving around when new buttons were added. Plus, it dries clear! 1. Cut out your stencil. 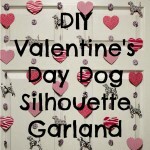 If you are using a dog silhouette, you’ll want to cut around the dog shape and discard the white border. However, if you are using the LOVE template, you’ll want to cut out the letters and paw print and KEEP the white boarder for tracing. This will allow you to keep the letters in the correct placement and distance from each other. As always, you can use any dog breed silhouette clipart. I chose to do a Beagle of course! You can also venture out to other animals – birds, rabbits, cats, llamas. The options are limitless. Do a quick Google search and I’m sure you’ll find a good option no matter what you select. Just make sure the image doesn’t have parts that may be too small for the buttons you have to fit. Get our LOVE template printable here. What dog breed or other animal would you feature in your button art? 2. Trace your template onto your canvas panel background. Add a bit of removable tape to keep your template in place. Then trace your chosen shape onto your canvas panel or other background material with a pencil. Once you have finished tracing the entire design, remove the paper. If you are planning to use a frame, make sure you leave enough empty space around all edges (about half an inch). I neglected to do this for my dog silhouette one, so it will have to remain frameless for now. Since cutting out templates can be a pain, I save them for future projects. Just remove the tape and keep the paper in a folder or scrapbooking case for next time! 3. Glue buttons randomly to fill up the entire shape. I spread out my buttons over my work space, so I could see all the options before I started gluing. Some buttons were more special than others, so I set those aside to be more prominently displayed on the top layer of buttons. Start with the bigger buttons to fill up the most space and try to alternate different color shades for a bit for variety. Glue on a single layer of buttons to start and make sure to keep within your tracing lines as much as possible. It’s okay if there is white space or if you can still see pencil markings right now. Don’t try to make it perfect! The randomness of the buttons is what makes each work of art so unique. Now go back over your shape with smaller buttons to create a second layer. Fill in any white space and cover up any remaining pencil marks. Don’t forget to vary colors and shapes to keep things interesting. 4. Let the glue dry. Aleene’s Quick Dry Tacky Glue needs about 35 minutes to dry. If you use another glue, make sure to wait the appropriate amount of time or play it safe and let it dry overnight. 5. Frame your beautiful work of art and display! For a standard frame you’ll need to remove the glass because the buttons will be too thick. I was able to actually store the glass behind my canvas panel in the frame. You can also try a shadow box or display case if you’d like the keep the glass. However, those are a bit more expensive. You did it! You have an awesome piece of artwork that any pet lover would be happy to have. Show it off with pride on your desk, mantel, or wall. I have one up in my office and another in our living room. Did you follow this tutorial? Comment with a picture of your finished button art! As always let me know if you have any questions or if anything is unclear. I’m always happy to help you make fun pet themed crafts! Did you enjoy this post? Share and pin it! DIY Valentine’s Day Treat Jar + ANNOUNCEMENT!